Conventional wisdom has lulled us into thinking that some parts of the aging process are inevitable, such as declining mental sharpness and fading memory. However, the truth is that modern medicine can treat – if not cure – age-related cognitive decline. In recent years, this has been an active area of research – including a recent study published in JAMA Neurology, which demonstrated how people who actively used their brains more often during middle and advanced age were mentally sharper later in life than those who did not. 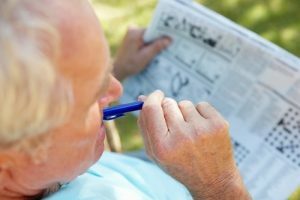 To better understand the issues surrounding mental acuity during the aging process, it is important to talk about what cognitive abilities are and what may affect them over time. There is evidence suggesting that everyone’s brains begin to shrink starting in their mid-20s. Brain cells begin to die off, there is an imbalance in the chemical messengers that cells need to communicate with each other and, over time, people begin to show signs of cognitive decline. Intelligence. Crystallized intelligence, which tends to remain stable over time, is the knowledge we accumulate throughout our lives. Fluid intelligence refers to abilities we have that are not based in life experience and may be more vulnerable to fading. Attention. Simple attention, which usually stays strong during the aging process, allows us to focus on one activity, such as watching a TV show. Divided attention, which is what we use to focus when we try to watch TV and talk to somebody nearby at the same time, may weaken with age. Language. Although our vocabulary may be intact as we age, it can become harder to remember or articulate words as we get older. Reasoning and problem solving. While familiar problems can be easy to solve, it may become more difficult to tackle new challenges. Speed of processing. Even if our brain cells can still perform the job they are supposed to, they may act slower and require more time to get the job done. Memory. The remote memory we use to recall events that took place years ago can stay robust as we age, but the ability to form new memories may become weaker. The process of cognitive decline accelerates after age 50, when the brain’s memory center, or hippocampus, begins to lose 0.5 percent of its volume every year. Once you know the potential cause of your loved one’s cognitive decline, he or she can take steps to halt this process. Your personal health advisor can connect you with specialists to assist with conducting a neurocognitive evaluation, sleep health assessment and cardiopulmonary testing. We suggest starting early to work with your advisor to develop a personalized and multidisciplinary program to improve the brain performance of your loved one (or your own, for that matter) and reduce future risk for later dementia and stroke. Treatment of apnea or other sleep problems. All of these lifestyle adjustments can not only protect the volume of hippocampus that is still there, but also restore what was lost.